You do the talking, Lily will do the rest! Business communication today doesn’t just happen in one format. If you are talking to a customer, chances are you will communicate through a mix of email and phone conversations. Until now, Lily has displayed all email messages between your team and a customer in the activity stream. Now it is possible to also see when a customer calls your VoIP number and even how long the conversation lasts for. 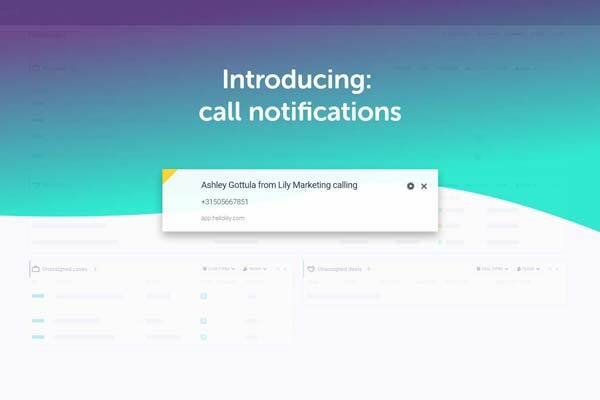 With inbound call notifications, you’ll see a message in the right upper-hand corner of your screen when someone is calling you. If this person is a contact, their contact information will also be present. In addition to the notification, the call will be logged in the activity stream. This way you or anyone else on your team can look back and see when there were conversations with this customer. You can also see who they talked to so that you know who to ask about the conversation. Currently, inbound calls, when someone calls you, are logged with this feature. Soon we will release the second part of this feature, outbound calls. Keep an eye on our blog and our twitter to know when outbound call logging is also available in Lily! Curious to see how this works? Follow this guide from our help center to set up the integration! An important thing to keep in mind: this integration works with VoIP telephony providers. Contact us for a current list of the VoIP providers we integrate with. You can also contact your VoIP provider to see if it’s possible to integrate Lily with them using an API. 4 thoughts on "You do the talking, Lily will do the rest!"